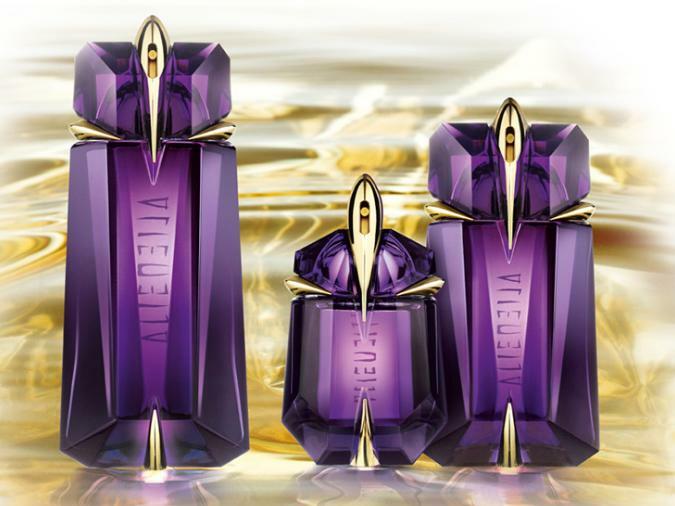 I remember Alien’s release well, in 2005 I had just started my love affair with perfumes and one perfume I had fallen for big time was Angel by Thierry Mugler, so the news of a brand new Mugler release was big news for me. My excitement grew even more when I heard the perfume was to be named ‘Alien’, has there ever been a more perfect name for a fragrance? I think not! Alien also holds a special resonance with me because it was that year I met my lovely boyfriend (technically he’s my fiancée but I don’t like the word) and Alien was the perfume I wore when we first met. He probably doesn’t remember the perfume that I wore, but I do and that makes it all the more special to me. On Thursday I will be reviewing the latest incarnation of Alien, ‘Alien Le Goût du Parfum‘ so I feel it’s only fitting to give the original a proper review, after all Alien is one of my all time favourites. Regular readers will know that I like my perfumes loud and ‘showy’ and Alien most certainly falls into that category, it is loud, proud and utterly beautiful. Alien opens with a huge, no gigantic, make that ‘EPIC jasmine note’, a note that is so strong and so loud that it can be smelled from space. It is the hugeness of the jasmine that has caused it to be described as an ‘Intergalactic Jasmine’ by the lovely Sheila of Scent Less Sensibilities, and she couldn’t be more on the mark. If you don’t like jasmine then you are probably going to need to put on your Space suit, a Close Encounter of the Third Kind with this Alien may leave you feeling completely overwhelmed. As well as being loud the jasmine is sharp and sour, there is a good deal of bright, sparkly citrus notes in the opening that bolster the jasmine and whilst amping it up they add a sweetness that stops it from becoming too green. After a while the jasmine decides that she is going to let the other notes get a look in and that’s when the cashmeran comes through. Cashmeran is a synthetic ingredient created by IFF (International Flavours and Fragrances) that smells, woody spicy and musky. In Alien the cashmeran is used to add a soft, hazy and woody aspect that acts as a support for the hyper-spaced jasmine. The cashmeran also gives Alien an earthy quality, almost like patchouli but not quite as bold. Alien dries down to a wonderful woody vanilla, which feels sweet yet dry, thankfully the jasmine stays throughout Alien’s half-life but it does get quieter and it joins the vanilla, amber, woods and musk which work together to create a glorious aura, a glowing light of fragrance that surrounds and envelops the wearer. I’ve always thought that Alien is one of those perfumes that suits being over applied, now I know most of you will disagree with me on that point, after all it isn’t always the most socially polite thing to do, but sometimes a fragrance is so good you just have to bask in it’s glory, and for me Alien is one of those fragrances. Alien that can abduct me anytime. Like a semi-precious stone mined on some far away planet the bottle perfectly fits the dramatic fragrance inside. Golden claws hold the precious amethyst coloured stone in place and the sharp, diamond cut facets reflect the light in hues of deep purple. 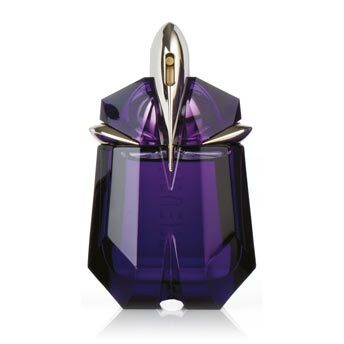 The pure parfum bottle comes complete with a golden claw applicator. Alien is available in 15ml, 30ml, 60ml and 90ml refillable Eau de Parfum. A 30ml non-refillable spray, Eau de Toilette, Pure Parfum and various Limited Editions are also available. Alien also comes in a variety of body products including; shower gel, body lotion, perfumed gold wax, and perfumed gel. This review is based on a bottle of Alien Eau de Parfum for my own collection. Posted in Feminine, Floral, Perfume Reviews, Thierry Mugler, Woody and tagged Alien, Jasmine, LOUD, Thierry Mugler, Woody Floral. Bookmark the permalink. Sheila has a real way with words! Great review, though I fear the jasmine note was a touch too EPIC for me and I was predictably completely overwhelmed. : – ) I guess you and I may turn out to be ‘evil scent twins’ (with me preferring the bland and the wimpy over the loud and ‘showy’ as a general rule). That said, we meet squarely in the middle with Elie Saab! The jasmine certainly is epic! I do like a bit of ‘oomph’ in my fragrances, especially my florals! It does look as if we will be the ‘yin’ to each other’s ‘yang’. It’s good that we have that middle ground too, Elie Saab is just so very damn good! I shall tell him that, I don’t imagine that he thinks that I see him as the ‘man of my intergalactic dreams’. LOL! Give the Space Cowboy a hug and a kiss on the cheek from me! He deserves it – and you, too! I had a hard time wrapping my mind around that intergalactic jasmine. I even had a hard time admitting to myself – for all I loved Mugler the designer – that I really, really liked Alien, and the more I wore it, the more I liked it! After all, Angel is perfumed Kryptonite for me – I loathe it with a fury, and I can’t tell you why, I just do. But Alien is…another kind of beast altogether . that intergalactic jasmine that just, well, BLOOMS (sorry for the caps lock, but it’s the only way to describe it!) – before turning into a soft, silky, cuddly creature. That was all fine and good. Alien had me somewhere in ‘The Fifth Element’ territory (my favorite sci-fi of all time) – incredibly hip, stylish and…just plain out there. Then, they came up with Alien Liqueur de Parfum. Intergalactic jasmine+an ambery, resinous, golden drydown to DIE for – and I was…done for! Resistance was futile. I was assimilated! No one, but no one, makes bottles like Mugler. They look like they belong on the dresser of someone nose-bleed stylish on Alpha Centauri Xa. I’m so glad that you’re a fellow Alien lover! The Liqueur de Parfum is amazing, but just wait until you try The Taste of Fragrance, Alien + Salt Butter Caramel is sublime! And also, The Fifth Element is A-MAZE-ING! How I love this! And how I love your review! Alien is so sweet and dry at the same time. Seriously, I have to sneeze continiously every time I wear this (which would be almost every day). It stays with me ALL day! I get the energetic EPIC (as you described so acurately) jasmine to wake me up in the morning, the sharp and chique cashmeran in the noon and the soft, cozy vanillic amber drydown in the evening. I’ve never known any perfume that would reflect the “stages” of the day so very well. I think you’ve summed it up perfectly! You made a good choice! is there by any chance how you can help me buy online? and how to go about it? There are lots of places online. I’m not sure where would be best to post to Africa, unfortunately. I don’t know if it’s the Cashmeran, White Jasmine, or Amber, but there is a scent in this fragrance that reminds me of bug/mosquito spray. Although, there is one scent that finishes off as a pleasent vanilla type appeal. This fragrance is not for me, but I think there are plenty of people who would love it. I think it will be the cashmeran. In isolation, cashmeran is sharp and slightly medicinal with a wonderfully velvety woody quality. That, with the intensity of the syrup-like jasmine is probably giving you that bug spray impression.